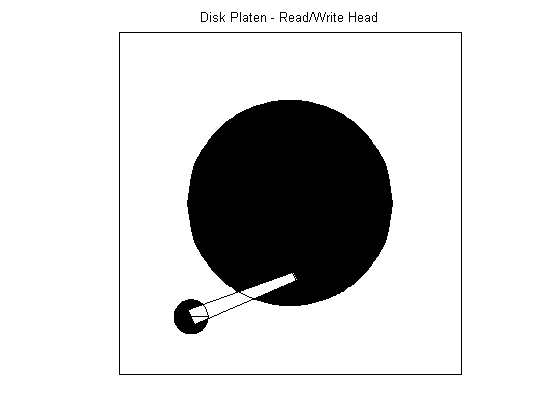 This example shows how to use Control System Toolbox™ to design a digital servo controller for a disk drive read/write head. 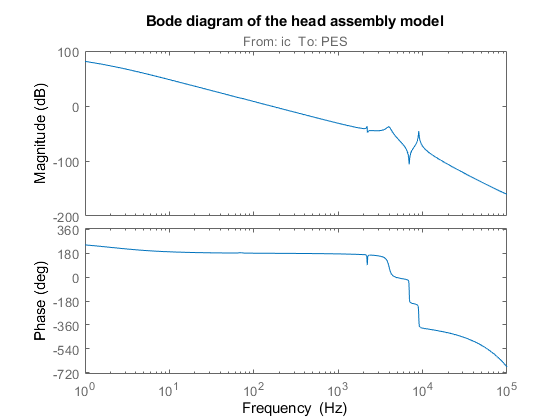 The head-disk assembly (HDA) and actuators are modeled by a 10th-order transfer function including two rigid-body modes and the first four resonances. 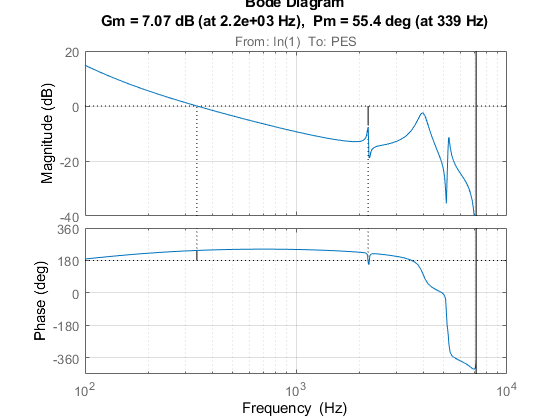 The model input is the current ic driving the voice coil motor, and the output is the position error signal (PES, in % of track width). The model also includes a small delay. 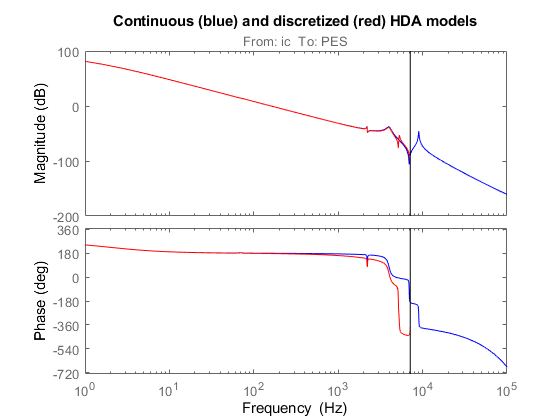 The coupling coefficients, damping, and natural frequencies (in Hz) for the dominant flexible modes are listed below. Servo control is used to keep the read/write head "on track." The servo controller C(z) is digital and designed to maintain the PES (offset from the track center) close to zero. 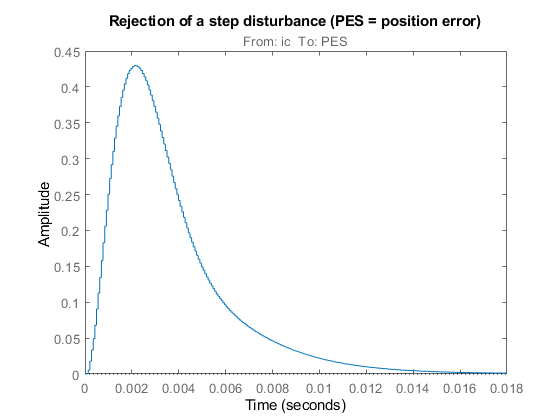 The disturbance considered here is a step variation d in the input current ic. 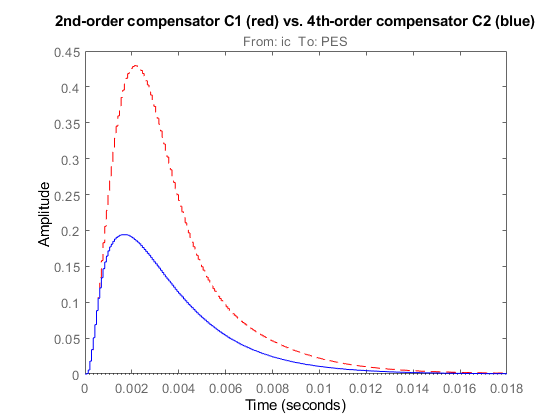 Your task is to design a digital compensator C(z) with adequate disturbance rejection performance. 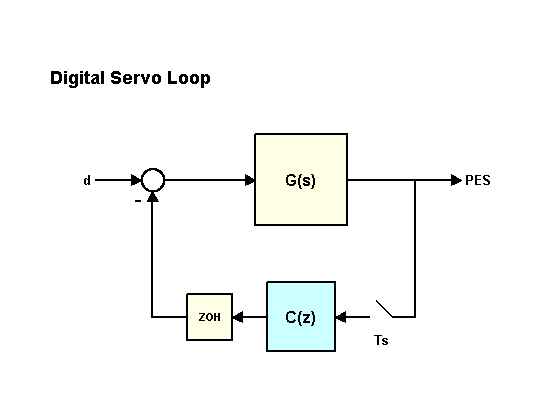 The sample time for the digital servo is Ts = 7e-5 sec (14.2 kHz). Realistic design specs are listed below. Now to the compensator design. 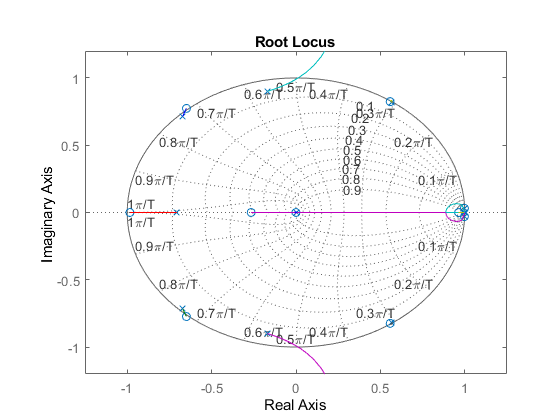 Start with a pure integrator 1/(z-1) to ensure zero steady-state error, plot the root locus of the open-loop model Gd*C, and zoom around z=1 using the Zoom In option under the Tools menu. Because of the two poles at z=1, the servo loop is unstable for all positive gains. To stabilize the feedback loop, first add a pair of zeros near z=1. 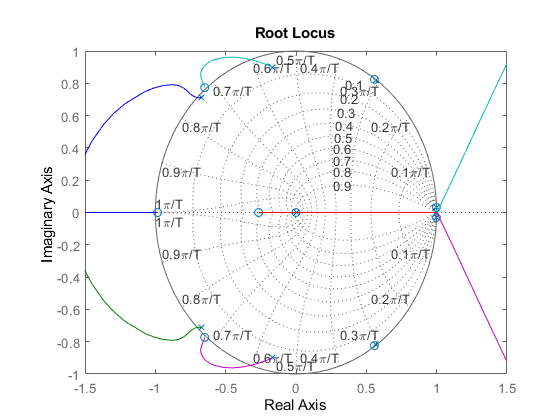 Next adjust the loop gain by clicking on the locus and dragging the black square inside the unit circle. The loop gain is displayed in the data marker. A gain of approximately 50 stabilizes the loop (set C1 = 50*C). 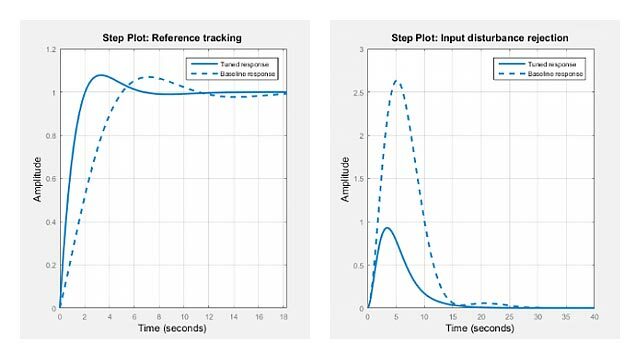 Now simulate the closed-loop response to a step disturbance in current. The disturbance is smoothly rejected, but the PES is too large (head deviates from track center by 45% of track width). 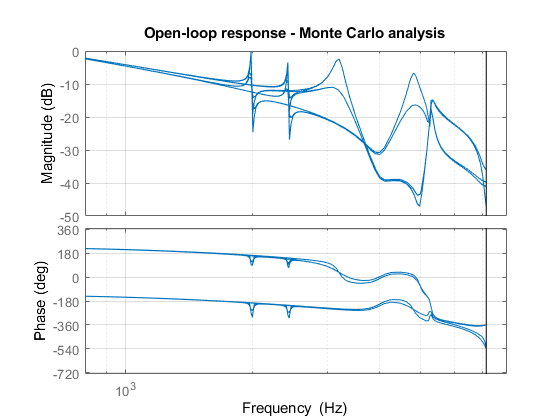 Next look at the open-loop Bode response and the stability margins. 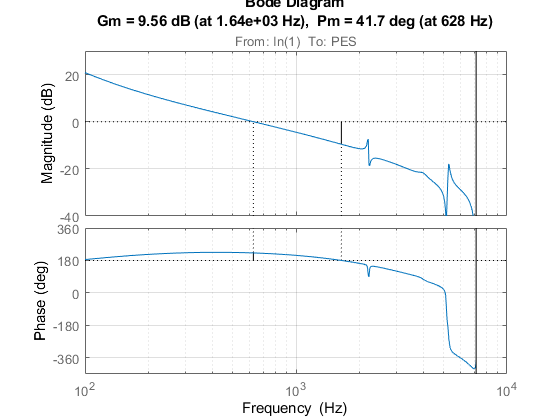 The gain at 100 Hz is only 15 dB (vs. spec of 20 dB) and the gain margin is only 7dB, so increasing the loop gain is not an option. 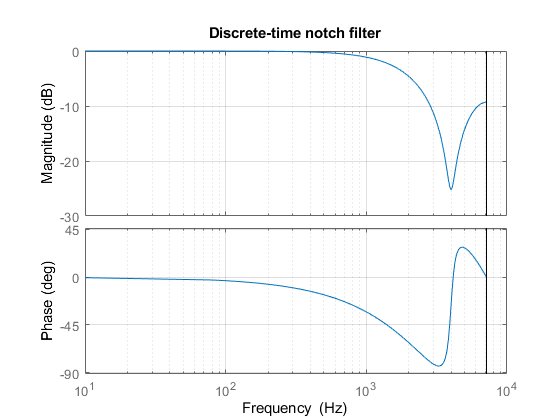 To make room for higher low-frequency gain, add a notch filter near the 4000 Hz resonance. You can now safely double the loop gain. The resulting stability margins and gain at 100 Hz are within specs. 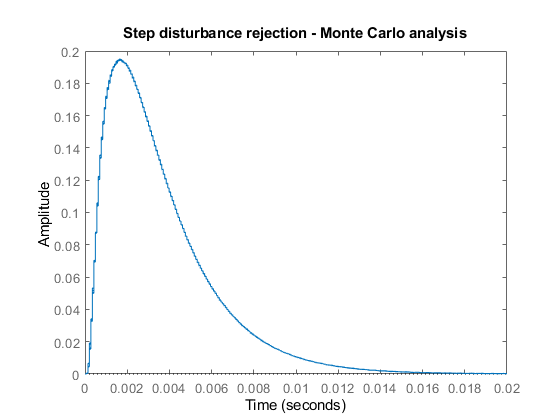 Step disturbance rejection has also greatly improved. The PES now stays below 20% of the track width. 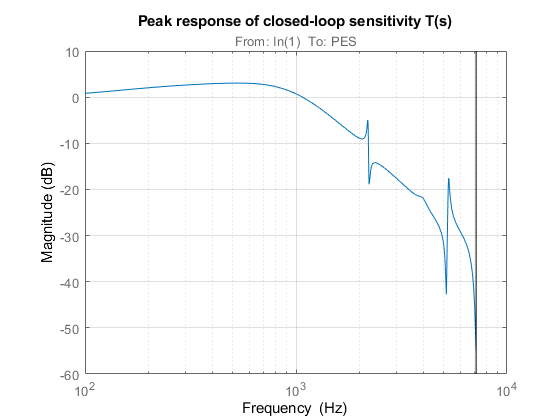 To see the peak value, right-click on the axis and choose the Peak Response option under the Characteristics menu, then hold the mouse over the blue marker, or just click on it. Finally let's analyze the robustness to variations in the damping and natural frequencies of the 2nd and 3rd flexible modes. Discretize these 16 models at once and see how the parameter variations affect the open-loop response. Note: You can click on any curve to identify the underlying model. All 16 responses are nearly identical: our servo design is robust!